2.5" Spotted Fritt Spoon - Blueish Green -The Greatest Online Smoke Shop! This beautiful square shaped mouth end to make it stand out and is fumed. Beautiful square shaped mouth end to make it stand out. 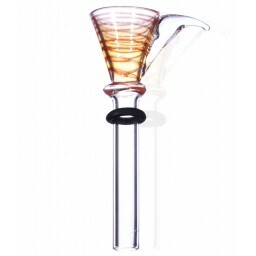 This fumed pipe has colored streaks going all along the head and tail.This item is a fumed color changer, meaning the more you smoke, the more the clear part of the glass will change colors. Colors may very, please look at pictures.